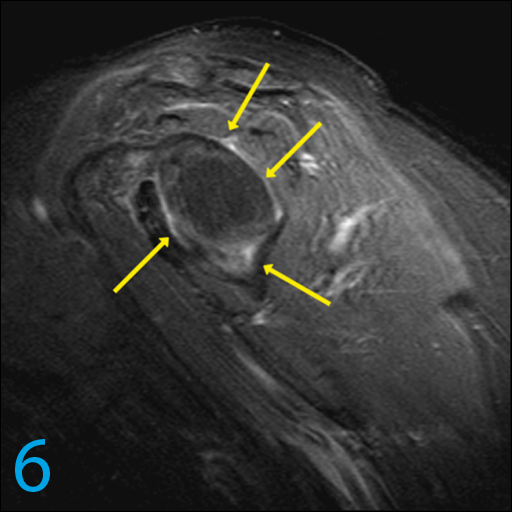 This 59-year-old female presents with left shoulder pain. 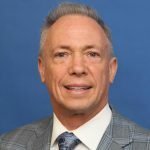 The pain began three years earlier after moving a heavy desk, and has progressively worsened even after physical therapy. There is also limited range of motion. Have a look at the highlighted regions of images 1 through 7, and see if you can identify the potential cause of this patient’s symptoms. 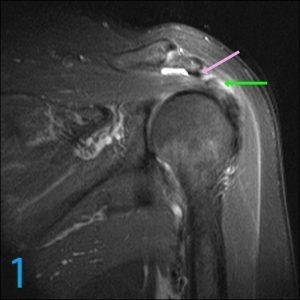 Q1 – When abnormal signal is detected in the rotator cuff, what other features should help guide interpretation as to the primary cause for this appearance? 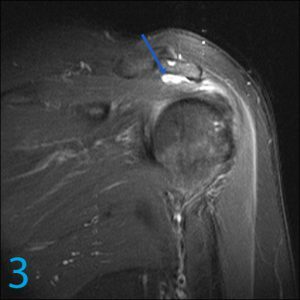 Therefore, subacromial impingement, and associated tendinopathy and peritendinobursitis, are the most likely cause for the patient’s symptoms. Although uncommonly seen at the same time, fibroinflammatory capsulitis can coexistent with impingement. 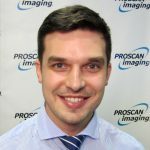 They coexist more commonly with partial, rather than communicating full-thickness, tears. This is because a communicating tear allows for inflammatory decompression into the bursal space, and prevents concentric contraction. As indicated above, adhesive capsulitis infiltrates the rotator cuff, and may produce T1 “grey” cuff ghosting. 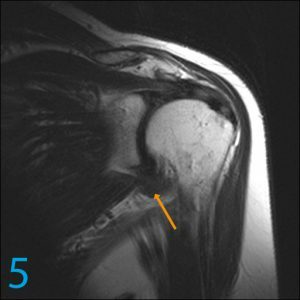 Sometimes infiltrative adhesive capsulitis and small partial tears may overlap or be difficult to differentiate. This is demonstrated by the thickening of the inferior glenohumeral ligament (image 4, yellow arrow) and anterior rotator interval (image 4, purple arrow), as well as a mild “corona sign” (image 6, yellow arrows). Additionally, note that there is no fluid in the axillary recess (image 5, orange arrow). 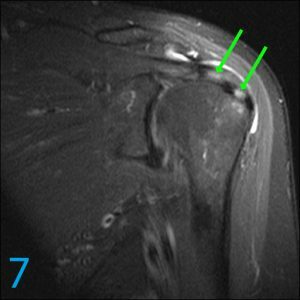 In this case, the abnormal signal in the supraspinatus tendon is not interpreted as being primarily due to infiltrative fibroinflammatory capsulitis; the dominant features of impingement. 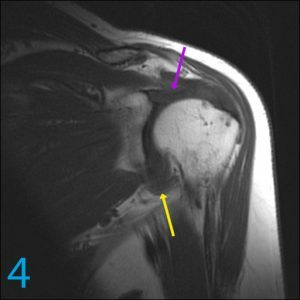 Can you classify this shoulder injury? 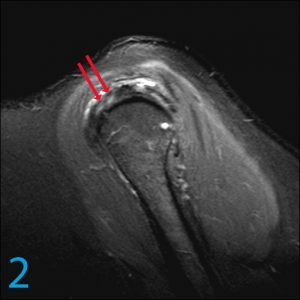 What is the cartilage telling us?